We help our clients sculpt their digital presence, no matter where they are in the process. Advisors who work with us are able to educate and communicate with their prospects and clients via automation and other digital marketing tools, which save an immense amount of time and ensures that they are putting their best foot forward. Our process helps firms communicate your company culture, brand and thought leadership. Our strategies minimize the time required to be effective. We are a digital marketing agency serving Financial Planners, Financial Advisors and Registered Investment Advisors (RIAs) market and brand their firm. Jake started this firm because his life's work is to support the growth of your firm and profession as a whole. We usually work with fee-only independent advisors. Most have a passion for Life Planning, Financial Planning 3.0 and exploring the deeper meanings of money with their clients. We work with you and your team to create a coherent overall online strategy to create a manageable digital presence. We help financial planners and Registered Investment Advisors sculpt their digital presence. We can assist firms in areas like website strategy, social media strategy, email marketing, and paid traffic strategies. We will help your business grow and maximize your team resources through digital marketing automation, tools and best-practices. We give you the beginning of the Online Reputation Management | ELEMENTS program to give you the fundamentals that you will need whether you work with the 4FP Agency or another digital marketing agency. After you have completed your Ideal Client Personas and Firm Style Guide your firm will be immensely more prepared with any marketing or design professional you hire. If you would like help completing any of the free materials we have sessions available. You work with one of our digital marketing professionals to create a robust ideal client persona or defining your story and brand through the Style Guide. When firms are ready for an assessment and a plan, they ascend to ELEMENT 4, where we complete a digital presence assessment. After receiving your assessment you can choose to get a plan from us or improve your presence on your own. Firms who receive a plan from the Digital Marketing 4FP Agency can choose to become retainer clients of the firm and have us implement and manage their digital presence or they can implement the plan themselves. This way we enable our clients to choose how much advice they need. We are here to support you at what ever level of digital marketing advice your firm needs. Jake's intimate knowledge of the Financial Planning profession makes it easy to be on the same page regarding my firm's vision and purpose. 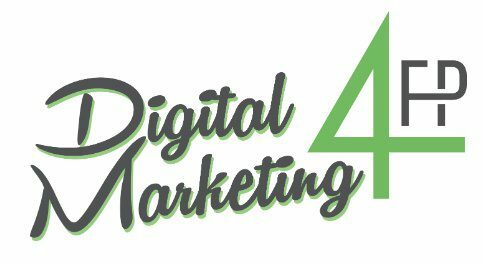 The Digital Marketing 4FP approach mirrors the planning process in that our conversations are always oriented around discovery and resourcefulness to come to solutions. His dedication to anchoring engagement strategy to who my ideal client is and how to best serve them is a good counterbalance to any business owner who has a tendency to get lost in the weeds of business operations and serving clients. Jake minimizes the pain-points of prospect/client engagement the same way we limit hurdles for our client's to have a healthy relationship with their money. Digital Marketing for Financial Planners are the digital-presence gurus. They deeply understand the paths potential clients take on their journey toward connecting with you directly. More importantly, they're fluent in the ways you can put your best message forward with those potential clients every step of the way. For advisors who understand the importance of owning their digital footprint and know they can’t manage it alone, this is the go-to team. Jake created the space and direction I needed to elevate my brand and business development. He listened, brought enthusiasm, ideas, and maybe most important, asked the right questions. He is always dedicated to making sure his vision and efforts on my behalf are aligned with my own vision and purpose. Jake has great communication skills and a good balance oftechnical expertise and business acumen. He knows how toexplain complex topics to the layperson and is proactive indiagnosing and assessing problems. I also appreciate howapproachable and easy to work with he is. In ‘Good to Great’, Jim Collins touts the benefits of “Getting the right people on the bus in the right seats”. With a shared vision and mission, I have been fortunate to get Jake on my bus and in the right seat of “digital marketing maestro” (his given title by me) in our organizations. The digital world is vast and I deeply appreciate Jake’s guidance as we course through this new, amazing, and opportunistic terrain. Guide your prospect along a natural path. Getting to know you and your firm's values and creating a relationship where you are their trusted advisor. Create content that supports your values and creates a journey for ideal prospects that cultivates them and encourages them to sign on board when the time is right. Create paid traffic strategies that compliment the rest of your content creation. We are about more than just creating "leads." We want to attract your perfect clients to you. The inbox is sacred and should be abused. We get too many emails and we need your prospects to *want* to open the emails you send them. We create combinations of automations and broadcast email campaigns that magnetize your ideal clients. SEO is a complicated topic. Some things are worthwhile to some firms and others are not. We help you evaluate and determine the best ways for you to show up in search and help you rank for the best search terms to attract your ideal clients. You need to know what KPIs to measure. Different companies and different strategies have very different needs about what metrics are important to monitor to create a successful digital marketing strategy and campaign. Know how to measure and optimize your process. Know what is working and what isn't so you can improve your systems.